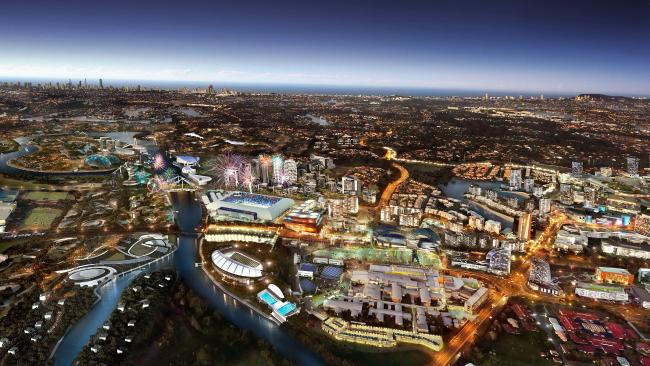 Robina Business Alliance’s vision for Robina and Varsity Lakes by 2050. A 300ha “Central Park” bordering Cbus Super Stadium is the cornerstone of a new “vision” for the Robina-Varsity Lakes area. 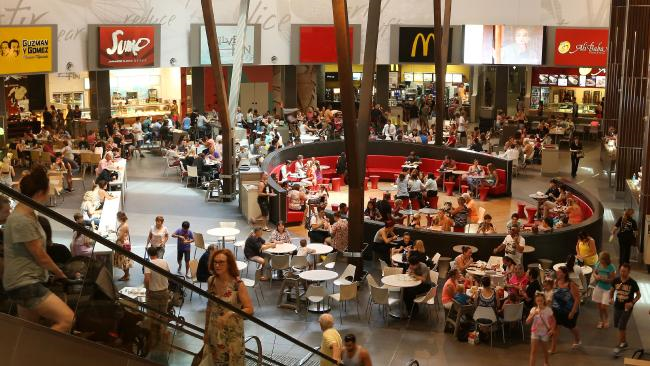 The Robina Business Alliance yesterday unveiled its concept for the expansive precinct, reminiscent of London’s South Bank, with president Ben Burgess saying they believed the suburb had the potential to grow into a CBD “that will complement Southport”. An aerial photo of the Varsity and Robina area looking towards Surfers Paradise. 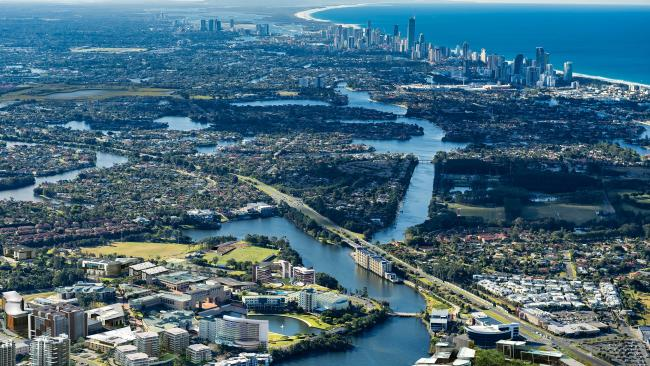 Built around eco-tourism and sports, the new Robina-Varsity Lakes will be connected by roads and bridges and integrate with existing major centres, including the health and education precincts at Robina Hospital and Bond University, and the Robina Town Centre. The area will feature the large park, to be called CityPark, on empty land owned by the Gold Coast City Council and the Robina Group, alongside Cbus stadium. It will capitalise on existing waterways and could feature a hotel, low-rise dwellings, recreational, sporting and conference facilities and a large, public open-space area. It is designed to encourage people to work, live and play in the area. Mr Burgess said the park would be modelled on New York’s Central Park and Singapore’s Gardens by the Bay. “We are looking to leading cities across the globe like New York, San Francisco and London — all of which are renowned for expansive parklands and green corridors,” he said. If the plan comes to fruition, the number of residential dwellings in the area could reach 45,000 by 2050 and the amount of office floor space could increase by more than 50 per cent to 290,000sq m.
Mr Burgess said new light and heavy rail connections would be needed. The RBA revealed its concept at a breakfast with social demographer Bernard Salt. Mr Salt said Robina-Varsity Lakes was the Gold Coast’s next key office precinct and would increase to 100,000 people, provide 50,000 jobs and contribute $5.4 million to the Gold Coast economy by 2050. Outgoing Robina and Varsity Lakes area councillor Jan Grew said she supported the concept plan and would support an upgrade to transport in the area. THE Gold Coast has to work with the infrastructure it has to cater for growth, rather than rely on dreams of alternate highways to save us from ­gridlock, says a leading social observer. Demographer Bernard Salt yesterday told business leaders at Bond University that with the city’s population expected to double in the next 35 years, work on infrastructure was needed now. “There is no great western corridor that is going to create a new version of the Gold Coast — what you see now is largely what you will see into the future,” he said. Mr Salt said the expected 561,000 extra new residents would need to be able to commute to major job centres. “The Pacific Highway must be doubled, the heavy rail and the light rail must be extended and doubled to make this city work at 1.2 million people,” he said. “(You have) stage 2 of the light rail up to Helensvale — I want stage 3. Mr Salt also suggested a “containerisation” of centres such as Coolangatta and Robina so people did not have to travel too far to work. “If you live in Coolangatta, why would you go for a job right up to the north?” he said. Mr Salt’s calls were echoed by Robina-Varsity Business Alliance president Ben Burgess, who said a light rail connection to Robina train station would help realise the alliance’s vision for the area.